Ticks can harm your puppy in numerous ways. Apart from itchiness and constant scratching, ticks can also lead to Lyme disease. The same is the case with fleas on puppies and dogs. Fleas give rise to flea allergy dermatitis and are also vectors of numerous diseases. Today I am going to tell you all about the best and safest tick control for puppies and young dogs. Most dog tick prevention products work for puppies but you need to taper the dose based on the puppy’s weight and age. Your vet can recommend the best tick spot control and other flea and tick prevention products that are safe for your pup. Here are some home remedies for ticks on puppies. Most vets do not allow pet owners to bathe the puppy until all of their first-year vaccinations are completed. I personally do not agree with this. If your puppy has fleas and/or ticks, the first line of defense should be a good bath. Use an effective vet approved shampoo containing ingredients like Permethrin. If you are against the use of chemicals, you can go for shampoos containing herbs or essential oils. Baking soda, apple cider vinegar etc can also be used for gently cleaning the pup. These products will not harm the puppy and yet they do a decent job of cleaning the pet’s coat. As soon as you notice the tick on the puppy, remove it immediately using a pair of tweezers. Make sure you grasp the tick as close as possible to the dog’s body. This will prevent any mouth parts from being left in the puppy’s skin. Dab the area immediately with some antiseptic lotion or rubbing alcohol. Make sure the pup is not able to lick these products. Keep an eye on the pet for a few days- if it shows any signs of fatigue, fever or paralysis, take it to the vet immediately. If you puppy has been bitten by a tick and you notice a swelling or redness, immediately administer ledum 30 C. Keep this medicine handy at all times and especially in tick season. For Lyme disease prevention, give Ledum 2 times a day for 3-5 days until swelling goes down. Vacuum thoroughly. Repeat the procedure every 2-3 days. Clean up your yard, especially if your puppy spends a considerable time outdoors. Keep the lawn trimmed since grass that is mowed traps less moisture and gets more sun. This inhibits ticks. Rodents harbor ticks so keep your yards clear of debris. If you do get rodents and possums etc, consider fencing your yards. A pest control may also be beneficial in such cases. The best method of tick control for puppies is prevention. Examine the pup from time to time. Make sure there are no ticks attached. If you see any, remove them immediately as described above. Tick collars work well in between baths and they contain chemicals like amitraz which repel ticks. I always recommend using tick collars with other tick control medications. Shampoos, powders, tick and flea sprays are some of the proven dog tick prevention products that may be used as part of your integrated tick prevention strategy. Adult dogs as well as young puppies can benefit from sunshine. Ticks aren’t sun worshippers so they hate it when their host bathes in the sunshine. 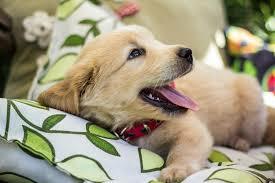 Of course, it is not advisable to keep your puppies out in the sun for too long, especially in summers. But a little bit of sun is always good for the pets. If you are camping or hiking with your pet, spray it with some permethrin based sprays or powders. This will deter fleas and ticks and is an approved tick treatment for puppies under 12 weeks. Tick medicines like Frontline are also approved for puppies 8 weeks and older. You can use them along with the tick collar or sprays. This spot treatment is applied in between the dogs’ shoulder blades which prevents ticks from attaching to the animal’s skin. Even if a tick does latch on your puppy, it will release its hold within 24 hours before transmitting any disease. Tick spot treatment medicines must be used once every month. Many naturopaths and vets recommend Echinacea. For puppies less than 20lb, give quarter of the human dose of this herb. For older dogs less than 50 lb, give half of the human dose. Echinacea builds immunity and is the best natural remedy to prevent complications for tick bites. I hope these home remedies for ticks on puppies help you.